From the home screen in the App Pick "+ ADD ITEM". The item window will pop up. You can enter a name (required), price (required), barcode (optional), color tag (optional) and tax (optional). 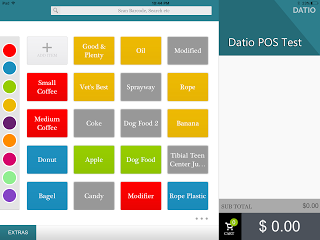 If you have our Datio POS base station, you can also just scan an item to get to this menu and the barcode will pre-populate then fill in your price and other information. This is what the menu will look like after entering the information. Your options now are add item to the cart and save, save only, or just add to cart and don't save. To edit or delete an item just press and hold on the item then you can edit or delete. 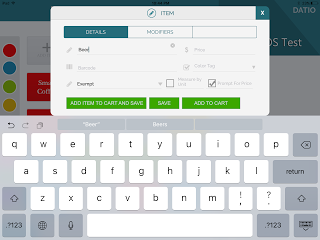 Item modifiers are used to add options or modifiers to an item. 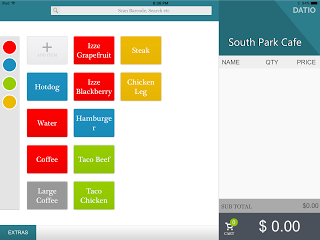 Some example is adding beacon or avocado to a hamburger. After adding the item such as hamburger then click on modifiers in the item menu. To get to the item menu click ADD ITEM or hold down on an existing item to modify the item. Now simply add the modify Beacon, Avocado or similar type modifier. Turn on notes to cover things like no bun or extra well done or extra hot. Modifiers can have a price or have no price ($0.00). Item by unit is a way to sell things by weight or length. Two examples are salad and rope. When the item is set up with the By Unit selected. A window will ask you to enter the weight. You can use this for selling meats, salad or things such as rope in feet. ITEM SETUP for convenience stores ? 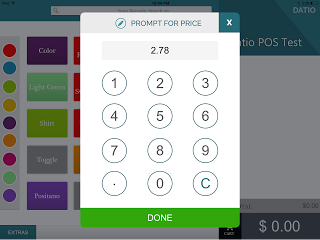 Prompt for Price an item set up option for convenience stores ? Many old fashion cash registers had departments or PLU (price look up). Prompt for price is our new version of an old fashion method. This feature can be used by a store that might have hundreds or thousands of items and don't want to add each item. If you did want to add thousands of items, send us your spread sheet and we will do it for you. Prompt for price is an alternative to adding each item. 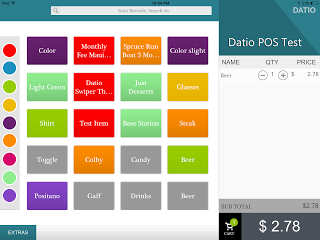 Prompt for price is a way to add an item called "Drinks" or "Beer" or "Chips". But instead of entering a price for each of these items when you select the item the system will ask your for the price. Let's show how to do it. From the home screen click + Add Item. Name your item and select prompt for price and save the item. Hit the X in the upper right to close the window. In this example my Item is Beer. Okay let's do a sale, select "Beer," the item we just created, and notice the software will prompt you to enter the price. Now you see the item in the cart for the price we entered it. Now click the "Total" to complete the sale. That is our version of departments or PLU (Price Look Up) but with a new twist. When setting up items you should select a color for each group of items. Maybe red for drinks and blue for food as an example. This will help you find the items on the home screen faster. If not color is selected it will appear grey on the home screen. To look at only red items select the Red button on the left of the home screen. To look at red and blue simply push each button. To turn off the sort push the button again.